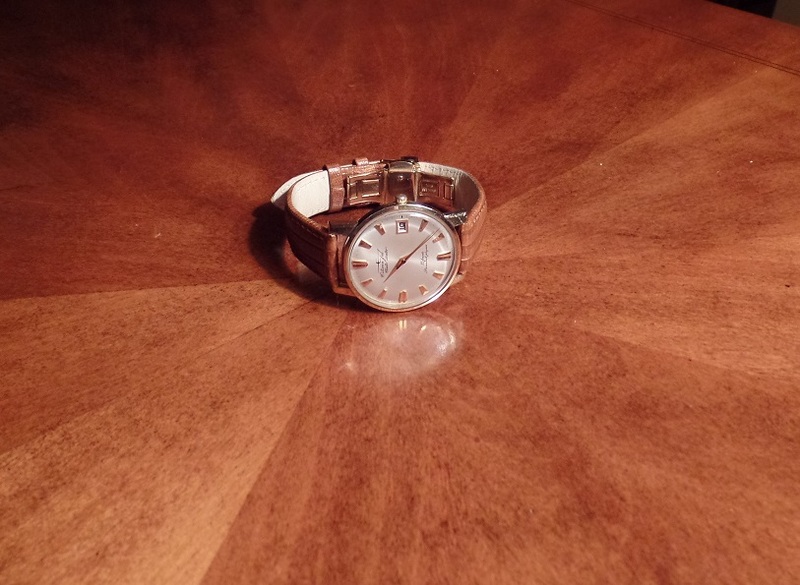 Miscellaneous: full cleaning/service completed within one week of receipt, watch operates perfectly. 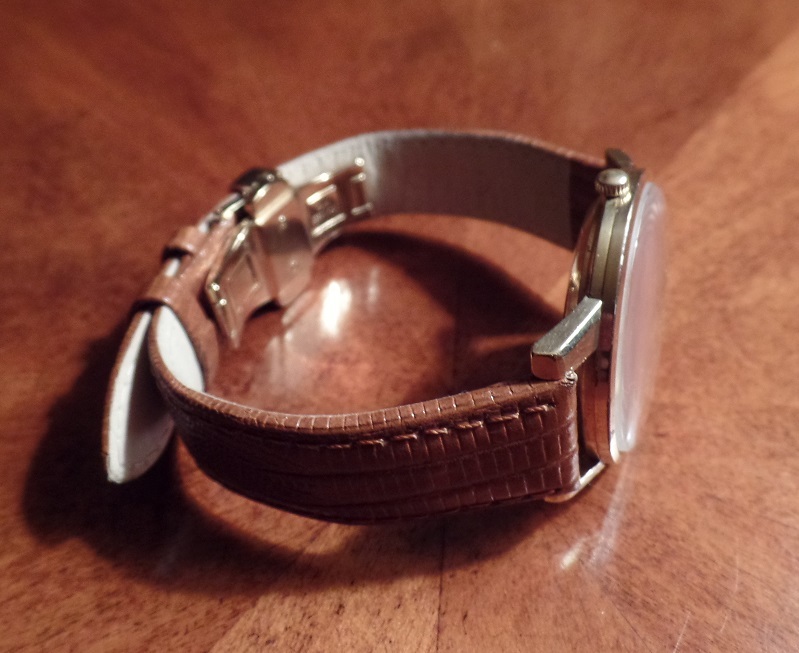 Will more-than-likely schedule this watch for yearly or even twice-yearly service, depending on amount of wear. 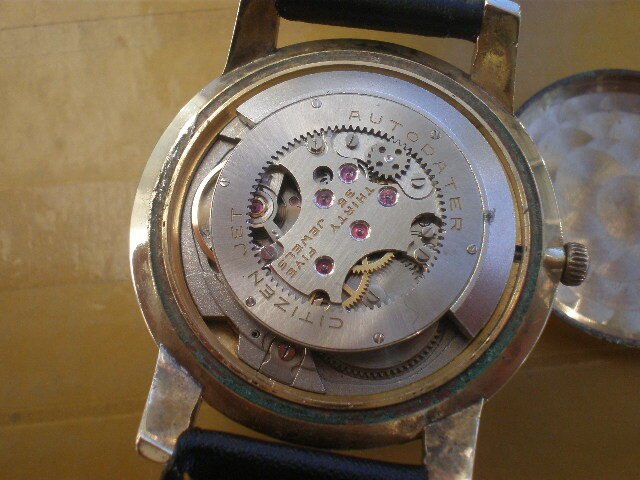 A number of watch companies – mostly Swiss – began to experiment with the geared rotor movement as far back as the late 1940's. 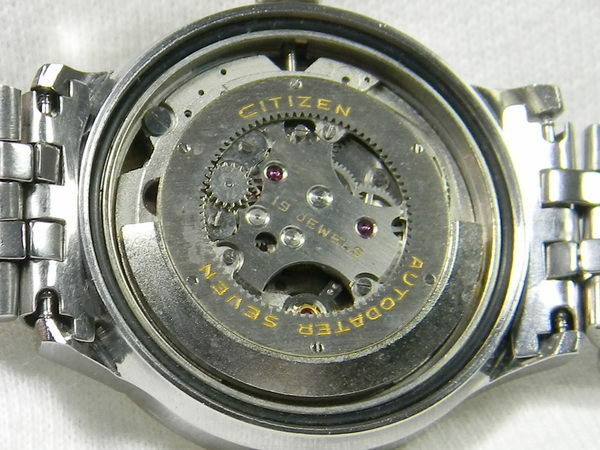 Citizen followed suit in the early 1950's, but it wasn't until 1958 that they developed and built what they felt was a market-ready version of the movement. Informally named the Jet series, honoring the arrival of what had become known as the 'Jet Age,' the earliest production models were released in very limited numbers, starting in 1959. These earlier models were fraught with mechanical difficulties and manufacturing errors, and Citizen, like the vast majority of the Swiss companies that had come before it, was just about ready to give up on the unusual – and trouble-plagued – movement. 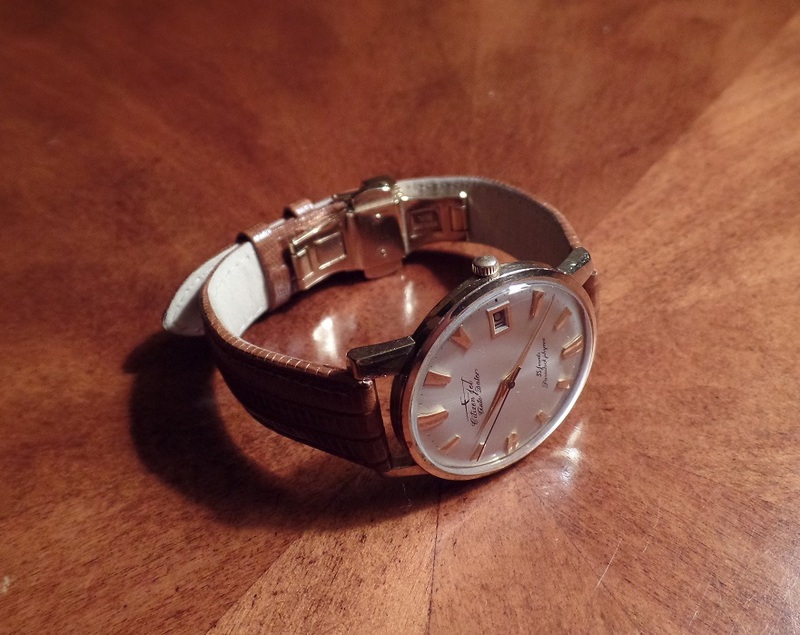 Nonetheless, they persevered in their efforts, making solid improvements to the movement design, function and manufacturing process, and by 1961 they were once again selling the watch on the open market. 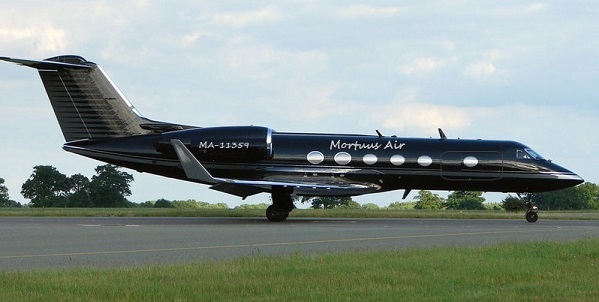 During this timeframe, the Jet models were all part of the Citizen ’03′ movement family, which was comprised of three groups, starting with the 03xx models, first seen in October 1961. These were followed by the 11xx in January 1962, and the 41xx, which was completed in early 1964. 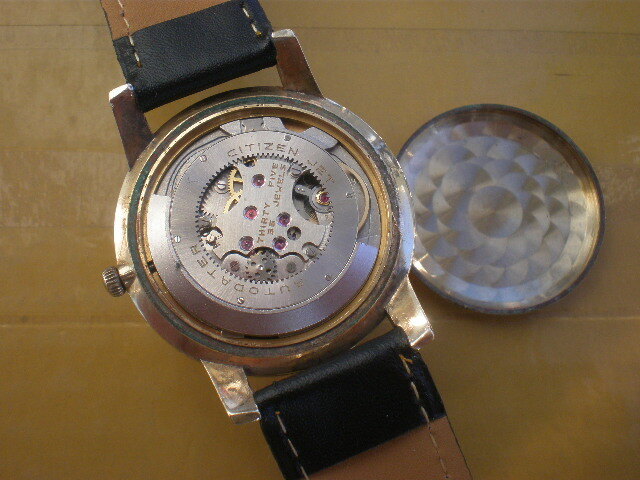 Interestingly, this last group included a one-hand winding model – the Jet 7 – which used the 23-jewel 4000 movement. All models worked extremely well, and were within a few seconds of accuracy as compared to their more common weighted-rotor counterparts. In the mid-1960s, the Jet movements were dropped in favor of the more conventional swinging-weight designs for Citizen’s high-end watches. I have read in a number of vintage periodicals and technical papers that the Jets were supposedly less reliable and/or accurate, but I’ve not found any hard evidence that proves this was actually the case. 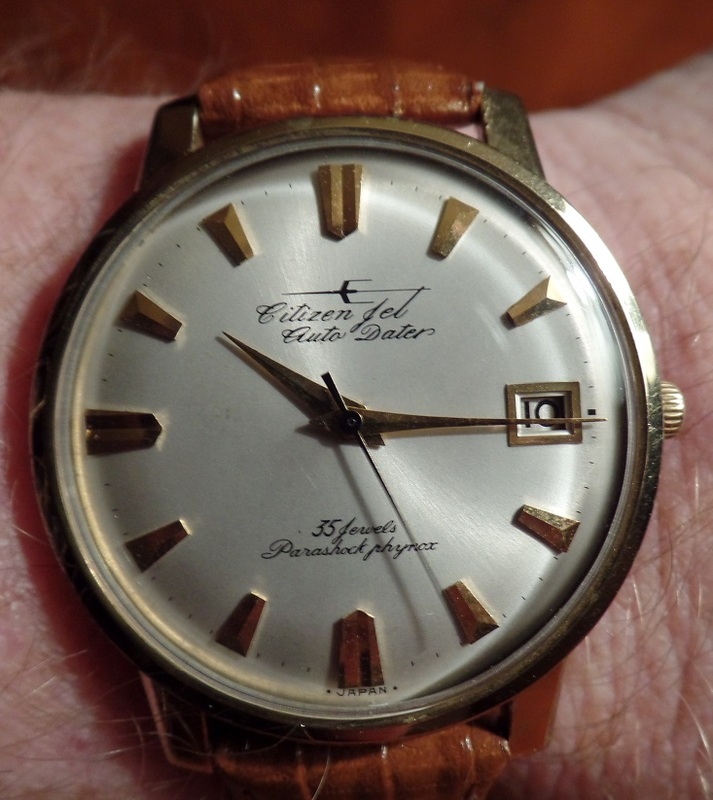 If I had to pin the sudden changeover down to one reason, my guess would be that the trend toward slimmer designs, to which the swinging weight was better suited, caused the Jets to be dropped and ultimately fade into Horological semi-obscurity by 1965. It should be obvious to even the most casual observer that the first thing to catch the eye is this watch’s incredible beauty. It just looks amazing. 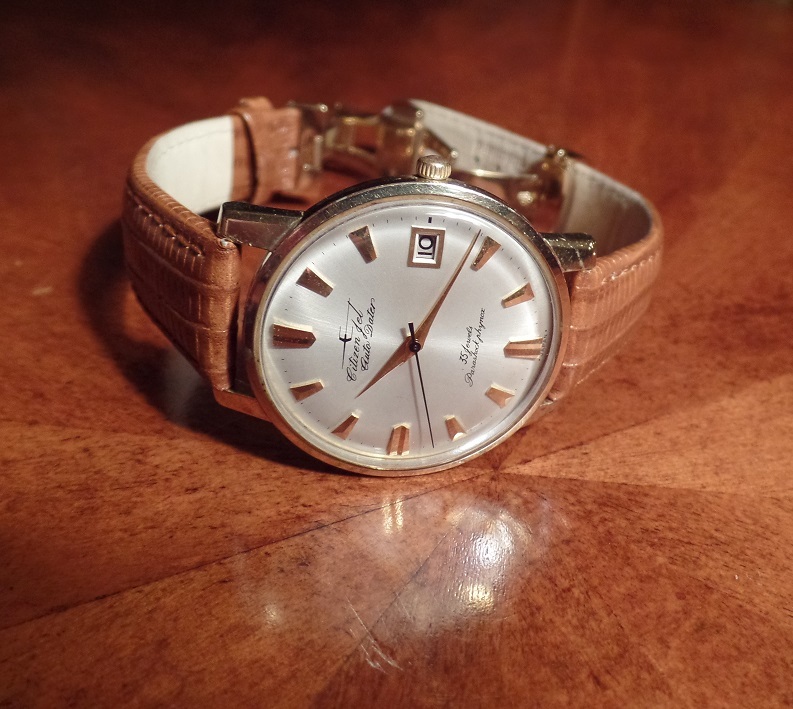 Although it’s pretty easy to immediately identify this watch as a vintage piece, the styling is truly timeless, with design details that are still used by high-end watch companies to this day. The biggest problem with this watch’s appearance is trying to figure out where to start describing its consistently superb details. 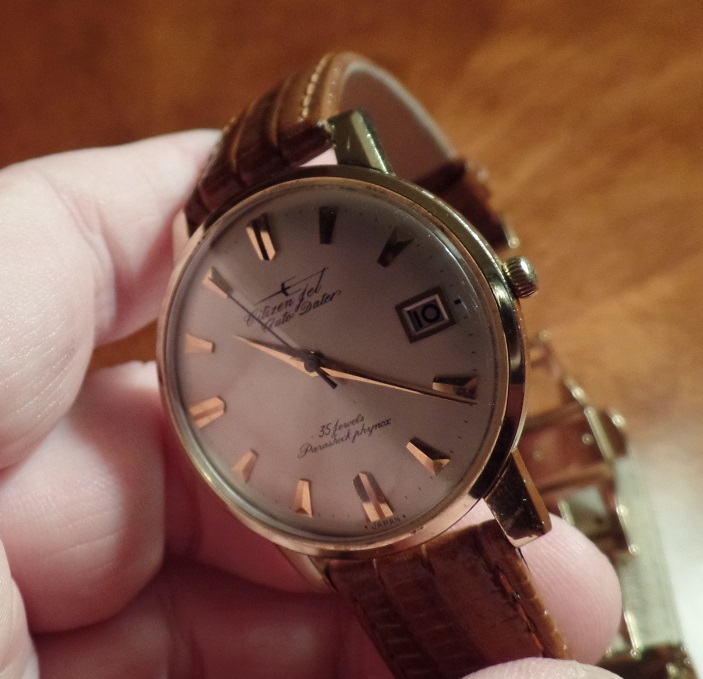 Take a gander at the cursive writing on the dial. This is an effect that has always exuded class in many of the older dress models, and a practice that is rarely accomplished with such beauty and skill these days. Really, it’s not that the modern versions look bad; they just don’t meet the same standards as were accomplished fifty-plus years ago, when such an exquisite technique was more common. The abstract ‘jet’ logo above the name block has the appearance of a casually-painted representation of what was then relatively new transportation technology; it looks truly elegant when combined with the dial’s cursive writing. 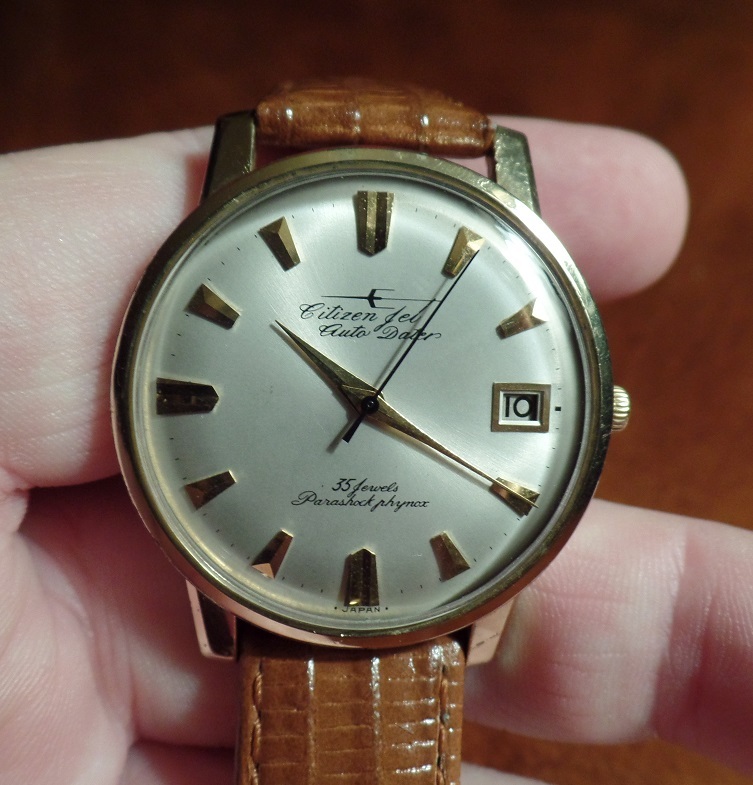 Back in the day, when people put on their best clothes to travel by air, this watch would have almost certainly been a perfect choice for wear, especially in the first class section. 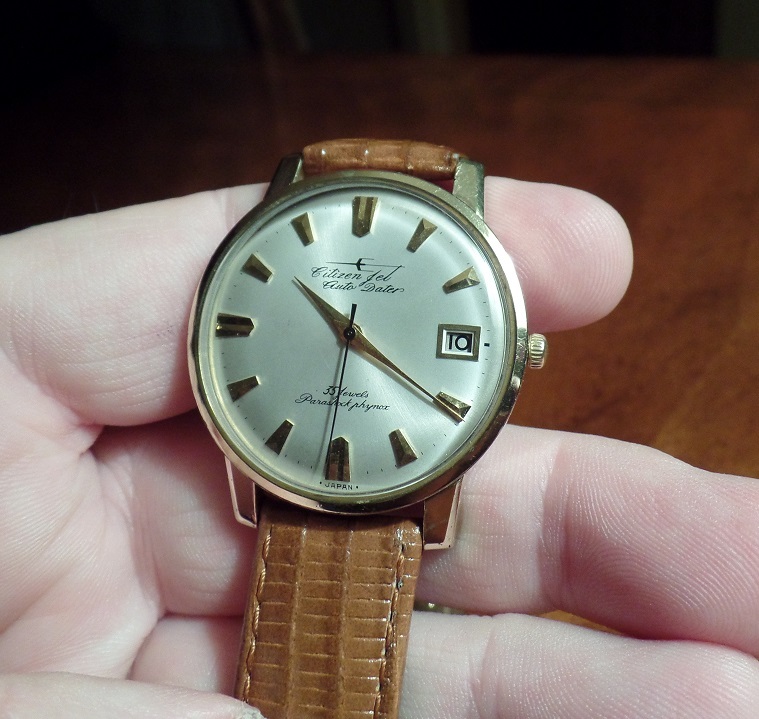 The dial was listed as having a 37mm width, but it looks like it’s at least 40mm, due in large part to the very narrow (~2.5mm) bezel (sorry, Sam; I had to mention it). 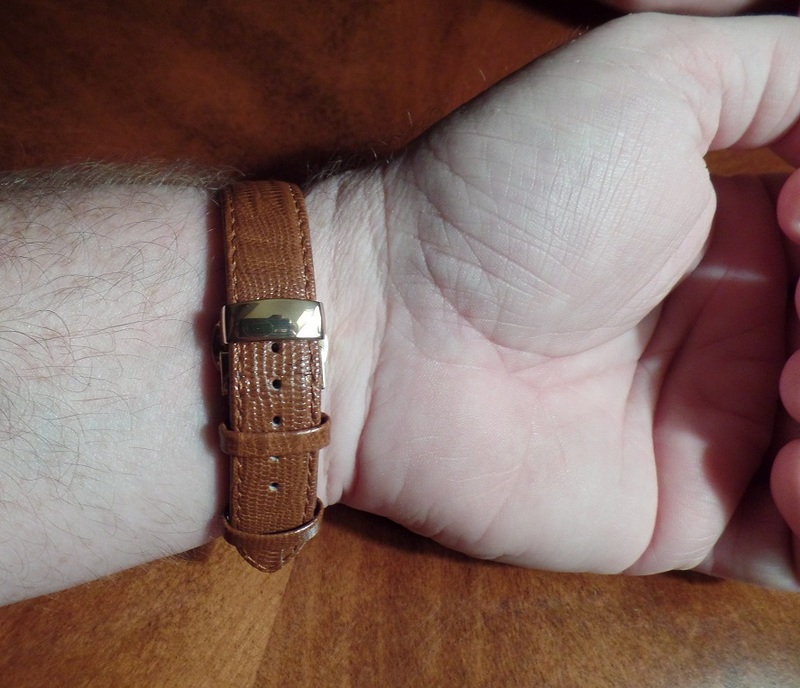 I took the time to measure it myself, and it is indeed 37mm. Nonetheless, given its larger appearance, the designers had to ensure that whatever adorned the dial was not too small and thus throw off its visual balance. They did just that, using applied trapezoid hour markers which, at first glance, look like longish arrowheads. They doubled-up the trapezoids at 6, 9 and 12 o’clock, making them narrower and, at the same time, longer, to ensure their width didn’t impact the spaces between them and their neighboring hour markers. Even the date window at the 3 o’clock position needed to be larger than what was common at the time, but this was achieved flawlessly by making it both wider and taller by roughly 1.5mm and 1mm, respectively. These otherwise minor detail changes gave the dial a perfect balance between its visually larger size and the placement and spacing of its many details. 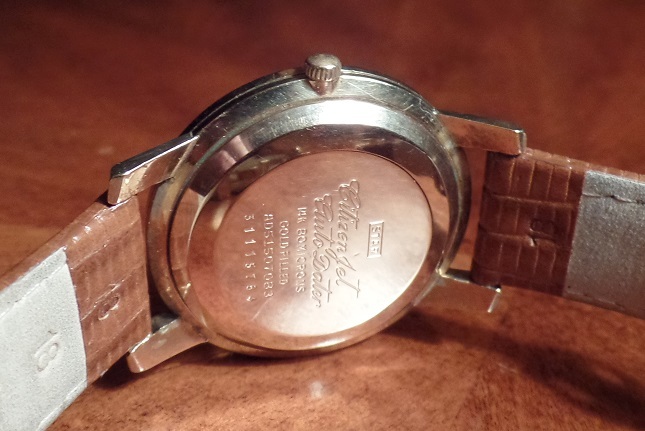 The 14k gold-filled case-back is every bit as attractive as the rest of the watch. 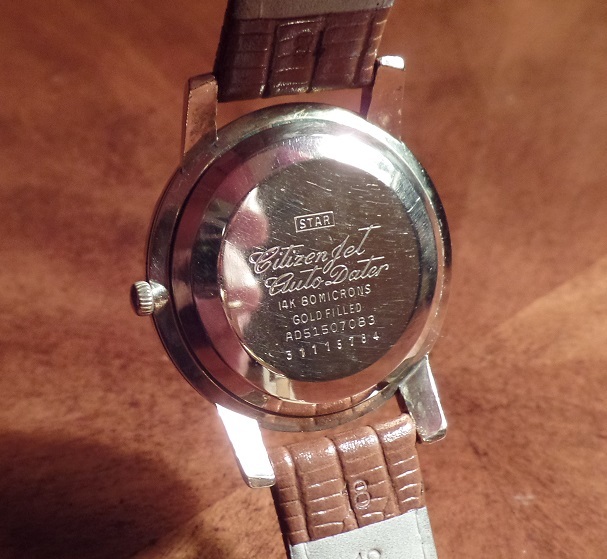 The gold is both generous and evenly applied at a thickness of 80 microns, and the engraving is very well executed and easy to read. 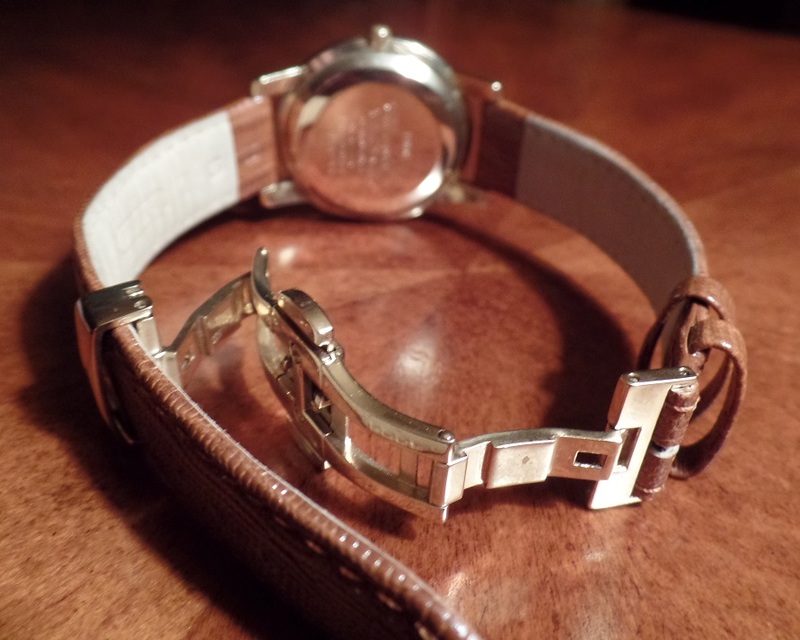 Most of today’s dress watches tend to avoid any type of meaningful plating on the case-back, and those that do tend to either keep it on the very thin side, use PVD coating, or both. 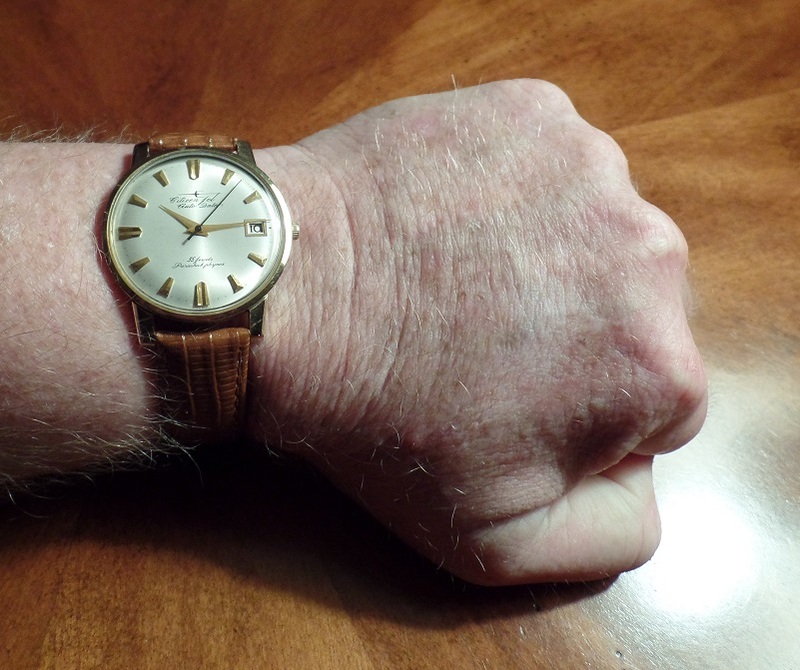 When I first received this watch, it had a 'plain Jane' black leather strap installed; certainly not ugly, by any stretch of the imagination, but nothing that enhanced its appearance. 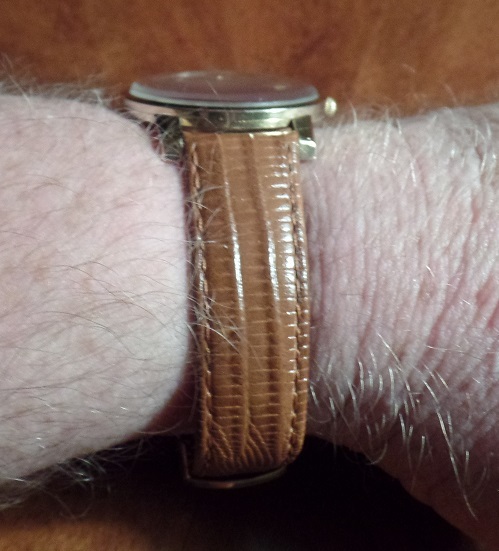 I've always been of the opinion that the more special the watch, the more special its strap (or bracelet) should be, and ultimately, the more exceptional it should make the watch look. 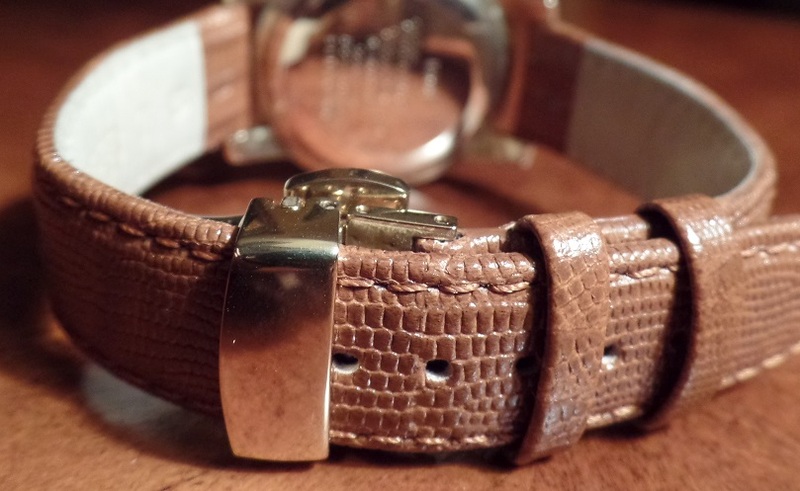 In the case of the gold Citizen Jet, I went with a beautiful 'honey-tan' Teju lizard strap from the great State of Texas. I like to think that its soft color adds to – without overpowering – the elegant 50 year-old styling. The mellow and subtle shading that is so common to the Teju, balanced with the gold of the case and the pale silver of the dial, gives it the look of an original strap, a task that is not at all easy to accomplish. 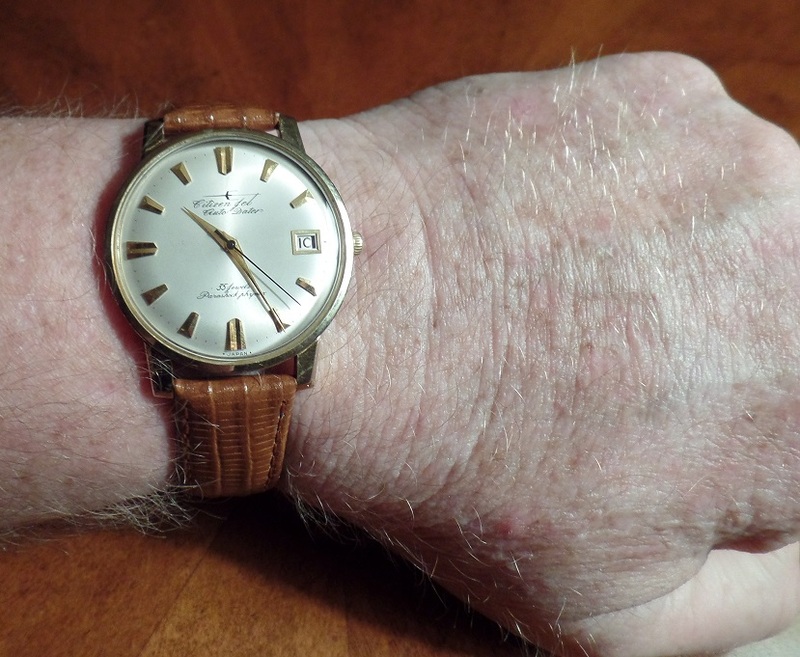 I own a good number of vintage – and non-vintage, for that matter – watches, and I have to say that this one is the most beautiful watch I possess. For that matter, it’s almost certainly one of the most beautiful watches I’ve ever seen, as well, though I have to admit that the Patek Calatrava and the Cartier Ballon Bleu give it a very strong run for its money, IMNSHO. Like its younger sibling, the Citizen 7 Auto Dater, this piece is built around a very unique ‘gear-tooth rotor’ movement, the Citizen Japan automatic, caliber 1120. 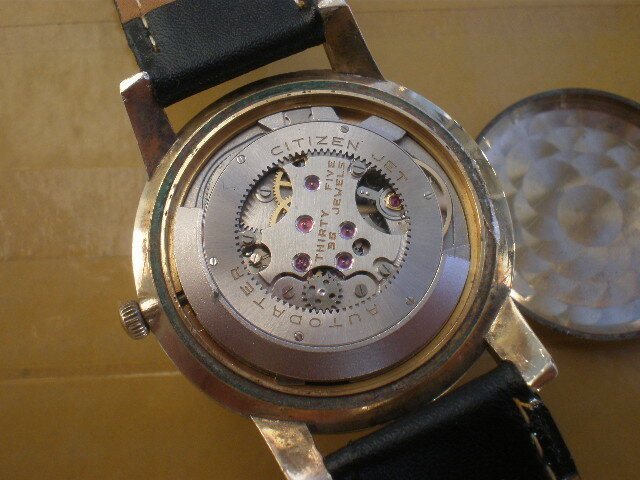 There is little difference between this movement – which is the older of the two – and the Citizen 7 Auto Dater from 1964. In truth, there isn’t a whole lot of detailed information out there about these movements, but what I’ve been able to ascertain is that from 1961 to 1964, which was the last year of Auto Dater production, only small proprietary changes were made, focused mainly on making the movement operate more smoothly and efficiently. In all honesty, I don’t notice any difference between the two, other than a minor delta in accuracy; Citizen 7 AD: -2 sec/day; Citizen Jet AD: -12 sec/week. Additionally, there are 16 more jewels in the Jet (35 vs. 19 in the 7AD), but these changes are largely transparent to the wearer. As can be seen, there isn’t a whole lot of difference between the appearance of the two movements, and even these are largely stylistic in nature, save for the additional jewels in the Jet AD. Both appear well-made and relatively new, despite both being more than 50 years of age. 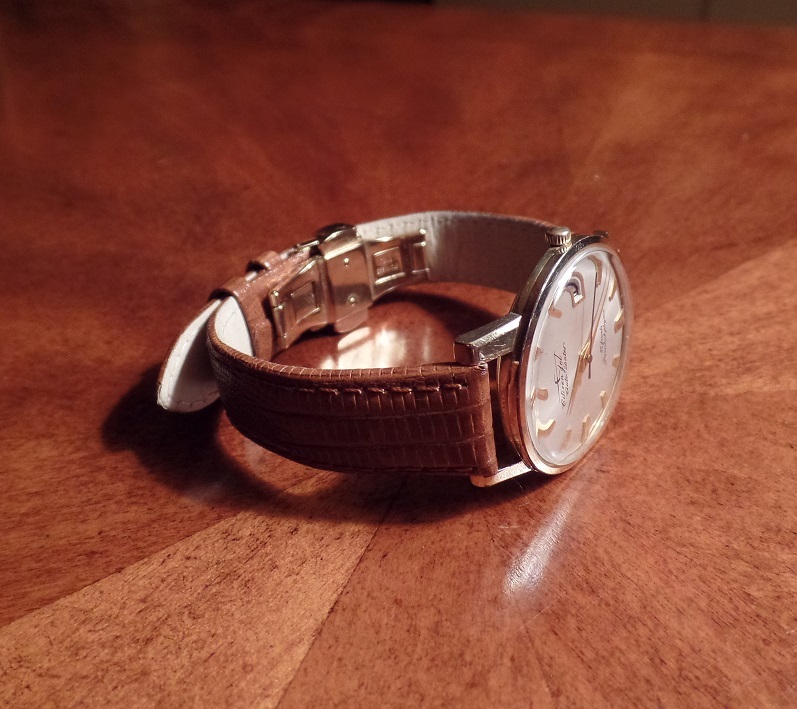 The feel of any watch is pretty much always the biggest challenge to try and convey to anyone reading your reviews. 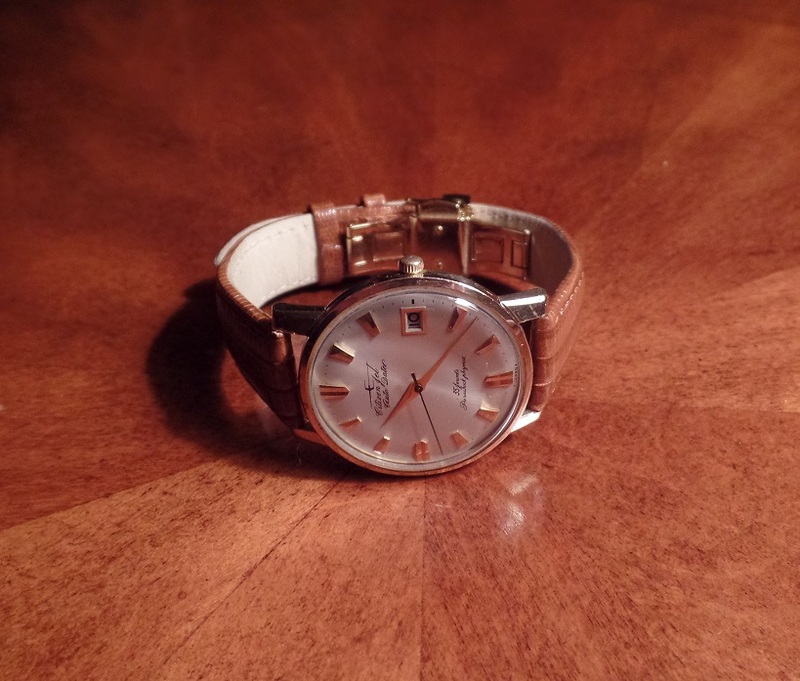 This watch is no different, save for the fact that, like its younger sibling, the 7AD, it possesses a distinct – and not-at-all unpleasant – ‘Valjoux wobble,’ as I call it. This wobble is also accompanied by the sound of the rotor sliding along its drive train and turning the small winding gear. This sound is also not at all unpleasant, a kind of rich, ‘silvery’ noise that tends to make you glance down at the watch and, for the thousandth time, marvel at its beauty and feel. And let’s face it; at 72 grams, it’s not going to weigh anyone down, other than, say, a Russian gymnast or an American jockey, and even then they’d have to wear a soaked bathrobe. 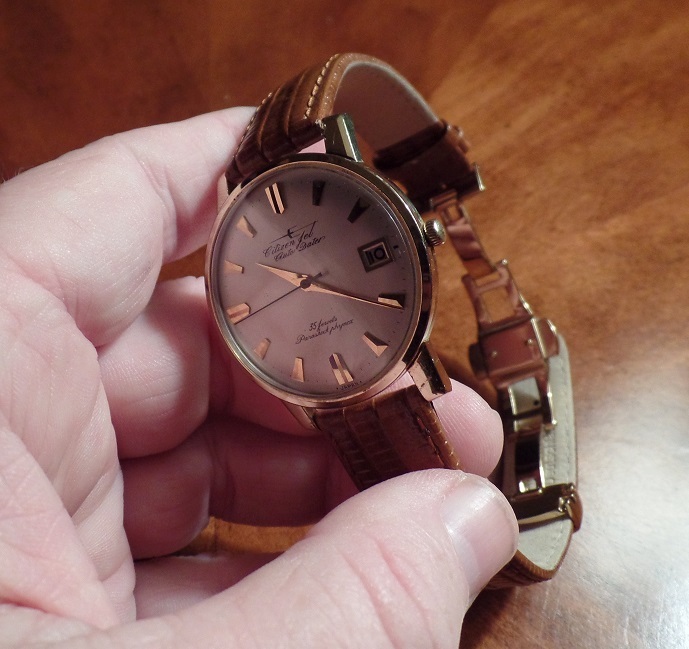 There's not much more to say about this watch, as it's been pretty obvious from the very beginning of this admittedly overlong review / introduction / literary love fest that I am absolutely smitten with this vintage piece. As those of you who've read my previous reviews know, I try very hard to lay out everything I can – good and bad – about the watch in question. 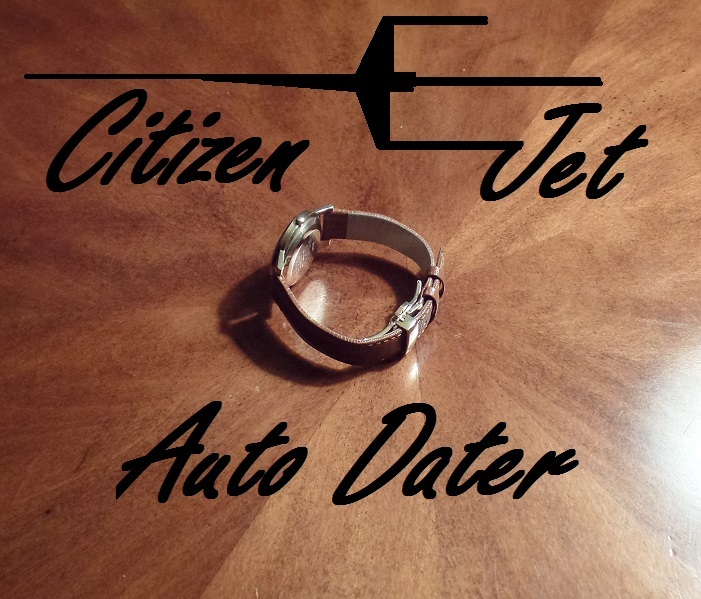 In the case of this Citizen Jet Auto Dater, other than a couple of areas of minor wear/tear on the case-back, sides and crown, there just isn't anything negative I can find. 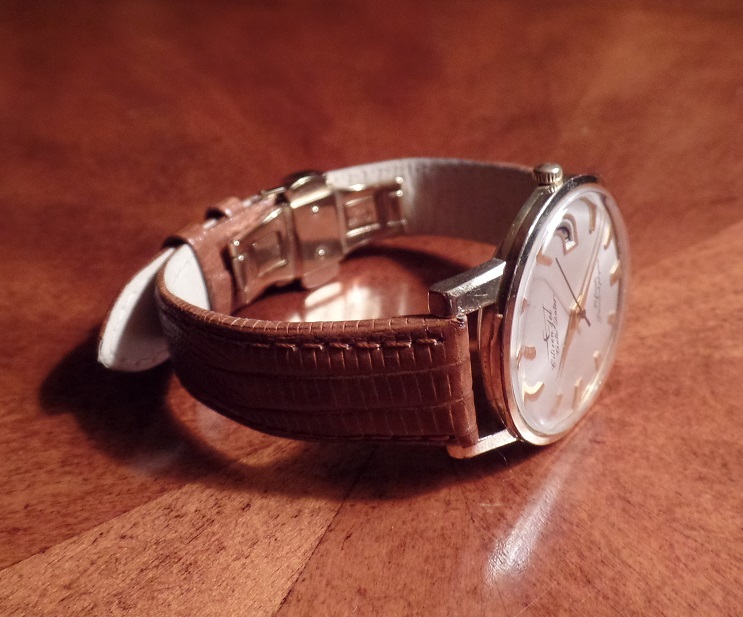 Oh, sure, there might be stylistic differences between myself and others, such as the strap selection I made, etc., but when speaking objectively, this piece is just about as close as you can come to an A+ grade for a vintage watch. As always, your comments, criticisms and suggestions are very welcome. Fantastic vintage find. The movement is intriguing. It might sound blasphemous for a vintage watch, but I would love to see it with a modern twist of an exhibition case back. It's a shame to hide it under a solid case back. I agree with you, great design all around from dial to lugs. Appreciate your review. Also, I am assuming you used your new camera. Definition and color of your pics are very good. wottime wrote: Fantastic vintage find. The movement is intriguing. It might sound blasphemous for a vintage watch, but I would love to see it with a modern twist of an exhibition case back. It's a shame to hide it under a solid case back. I agree with you, great design all around from dial to lugs. Appreciate your review. Many thanks, wotts! 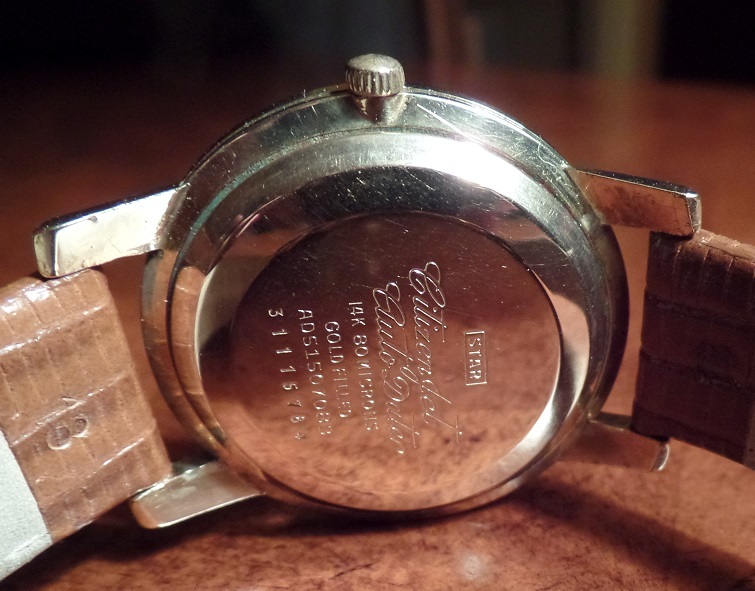 I have often thought the same thing about these vintage autos, especially with a movement as unusual as this one. There are those who would call it 'blasphemus,' but so many of the old autos' movements are literally works of art that are lost by their isolation. Great to see you back on WL, eh-wotts! Nice Mort, very good find from an era that has become the bane of my experience and the most thrilling also. Working on some of these older movements have become very hard since the parts are harder to come by. Ocean wrote: Nice Mort, very good find from an era that has become the bane of my experience and the most thrilling also. Working on some of these older movements have become very hard since the parts are harder to come by. Many thanks, O. This particular seller is someone I've been working with for quite a while, and even then he had to go out of his way to reassure me that everything was where it was supposed to be, was in good shape, and worked as designed. And even with all of that, the first place it went when it got over here was my Watchmaker, who went through it and gave it a clean bill of health. 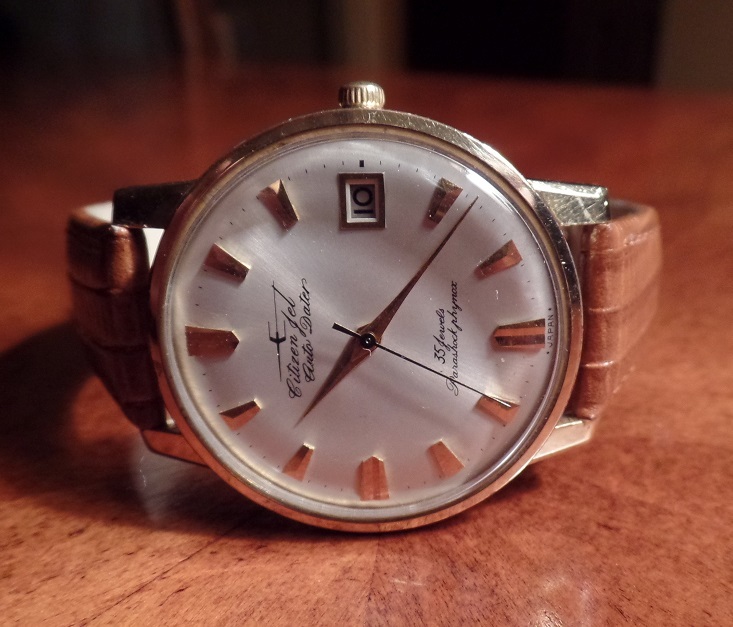 (He didn't charge anything for the cleaning, he said, because he was so excited to get the chance to have a look at the unusual Jet movement... ) This will either be one of the best investments I ever made in horological history, or a wearable money-pit... ... we shall see.